Description: God's Word For Overcoming Anxiety, Fear & Phobias. Bite Sized Bible Studies. If you’ve ever been anxious, afraid or panic-stricken, this Bible study is for you! Fear is one of the enemy’s chief tools for paralyzing people. God wants us to be free from fear by being full of peace, love, faith and courage. 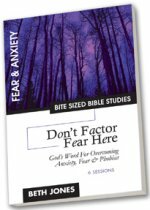 In this study, you’ll learn about God’s answers to common fears and phobias.